Thunder Bay, ON — On Friday morning, local MPP Bill Mauro and Ontario Trillium Foundation volunteer Lesley Bell met with representatives from NorthBEAT and St. Joseph’s Care Group to formally congratulate them on the $882,500 Youth Opportunities Fund (YOF) grant that they received from the Ontario Trillium Foundation earlier this year. The event was to launch the NorthBEAT Collaborative to assist young people experiencing psychosis. “I am pleased that the funding announced today is being used to take a collaborative, and comprehensive, approach to the early identification of psychosis, and referral to appropriate supports. It’s absolutely critical that our youth get the supports they require at the right time and place and that family members, friends and service providers from a variety of sectors are all working together for the best outcomes. 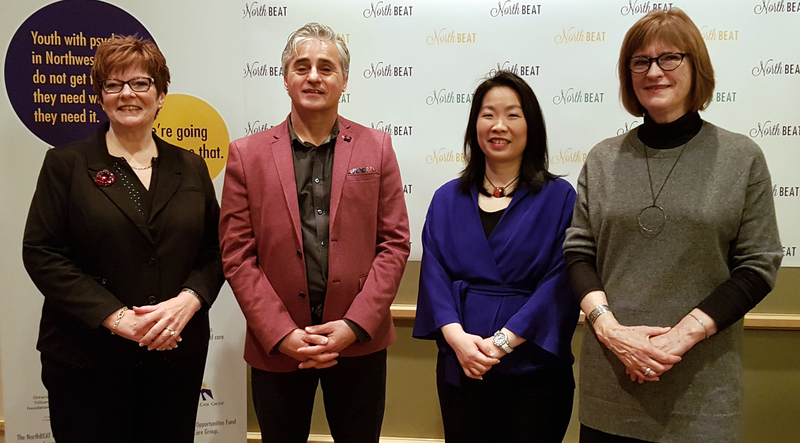 I want to congratulate NorthBEAT and all of the partners involved in this innovative project to assist youth in our community who are living with psychosis.” – Bill Mauro, MPP for Thunder Bay-Atikokan. Funds from the four-year long grant will support a collaborative initiative to improve the system of care, detect psychosis symptoms early on, and enable youth living in Northwestern Ontario to access appropriate services. The project is designed to improve connections between sectors, redesign existing resources and build the capacity of service providers. “The NorthBEAT Collaborative initiative is a wonderful opportunity to make the necessary enhancements to support for some of our most vulnerable community members, our youth. This is not only an important investment in improving access to services and mental health care for youth and their families, but is also an investment in the future of our youth so that they can lead more engaged and fulfilling lives.” – Michael Gravelle, MPP for Thunder Bay–Superior North. The term “psychosis” describes conditions that affect the mind, causing a loss of contact with reality or trouble deciding what’s real and what’s not. Psychosis can be treated. Early detection and specialized support helps optimize recovery and helps youth live meaningful lives. YOF is an annual program that provides grants and capacity building supports to youth-led grassroots groups and collaboratives serving young people who face multiple barriers to economic and social wellbeing. NorthBEAT received funding from the Strategic Collaborations Stream that supports collaboratives working to improve systems of services and opportunities for marginalized youth. “Youth from Northwestern Ontario who experience psychosis – a serious, mental health symptom – often do not get the help they need. With an $882,500 grant from the Ontario Trillium Foundation’s Youth Opportunities Fund, the NorthBEAT Collaborative members will work together to make it easier for youth with psychosis to get the care they need, where and when they need it,” said project lead Dr. Chi Cheng (Child and Adolescent, Adult Psychiatrist) at the project’s launch. The vast geography of the region means that people often live far from services that could help. Unique social and economic factors including: stigma of mental illness, trauma and loss, communities in crisis, culturally insensitive models of care, systemic racism, and poverty.